Technical Car Experts Answers everything you need: Ac vacuum line on dodge cummins? You don't need to pull the radio or take half the dash apart. The connector is lower down, on the same level as the gas pedal but in the middle of the cab. It's got maybe 8 vacuum lines on each side, all different colors. In many case when Ac only blows through defrost vents.You need to inspect this vacuum line/. Pull the supply line off of there,its a red vacuum line, start the engine, and see if you've got vacuum.There is one more line that is black one. Try the black one (the lower one in your picture). For that you have to pull the glovebox door off. Once the glove box is out you can easily reach in back by the firewall side, and find the hose where it comes in with the A/C lines.Pull that hose back and forth from one side of the cab to the other, to make sure you are checking inspecting the right line. 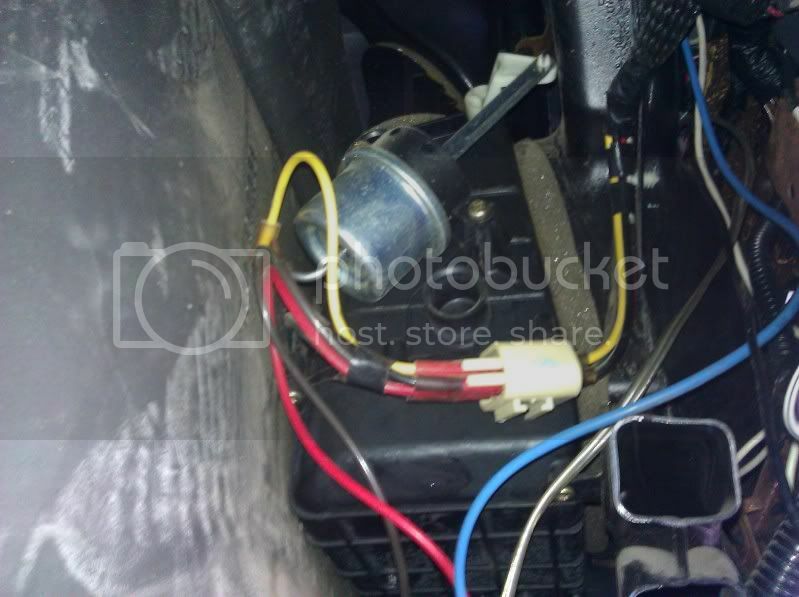 Once you confirm its correct line ,then disconnect it off of the vacuum connector,you can see that in the picture shown above, and see if there is no vacuum with the truck running. Then get under the hood and pull it completely out through the firewall. The bad spot sometimes is very minor so pull the line completely out,to get complete idea. Because you can't really get to it with the dash installed. There can be small spot where the hose connects or a pinched line, probably about 4" back from where it comes through the firewall. After that inspect the supply line back over to the vacuum pump. Before it goes into the pump, it goes into a large Tee with a couple other vacuum lines and plugs. Move some of the plugs around, and put it back on a different spot (closer to the driver's side). This allows you to run the line right through the grommet on the driver's side firewall, rather than across the engine compartment, into the cab, and back across the dash. This basic details will help you. How to Replace Blower Motor Wheel? How to Replace Blower Motor on 2008 Honda Odyssey? How to Remove Blend Door Actuator on 2008 Honda Odyssey? How to Remove Passenger Side Blend Door Actuator on 2008 Honda Odyssey? How to Remove Driver side Blend Door Actuator on 2008 Honda Odyssey? Blower motor Resistor shorting problem?